As Congress welcomes a new class on Thursday, ABC News has the latest on the government shutdown. As Congress gets sworn in on Thursday, some congresswomen who made history in November are starting work. In what some refer to as the "pink wave" on Election Day 2018, a record number of women were elected to Congress. For the House of Representatives, these women include the youngest woman ever to serve and the first two Muslim women to serve. After taking the oath, the new Congress is faced with a daunting task: ending the standoff about funding for President Donald Trump's proposed border wall in order to end the government shutdown. In the U.S House of Representatives, where Democrats have a majority, Rep. Nancy Pelosi (D-CA) was elected as the Speaker of the House. Pelosi, who also led the House from 2007-2011, is the only woman to ever hold the position. Here's a look at a few of the lawmakers who are making history as they take office. At just 29, Rep. Alexandria Ocasio-Cortez (D-NY) is now the youngest congresswoman ever. The former waitress and community organizer, who upset the incumbent in the Democratic primary election, represents New York's 14th district. "We're in the building," Ocasio-Cortez captioned a Vanity Fair photo showing herself and several other historic new members of Congress. Ayanna Pressley, the democratic winner of the Massachusetts 7th congressional district speaks at a rally at City Hall against Judge Brett Kavanaugh, Monday, Oct. 1, 2018. 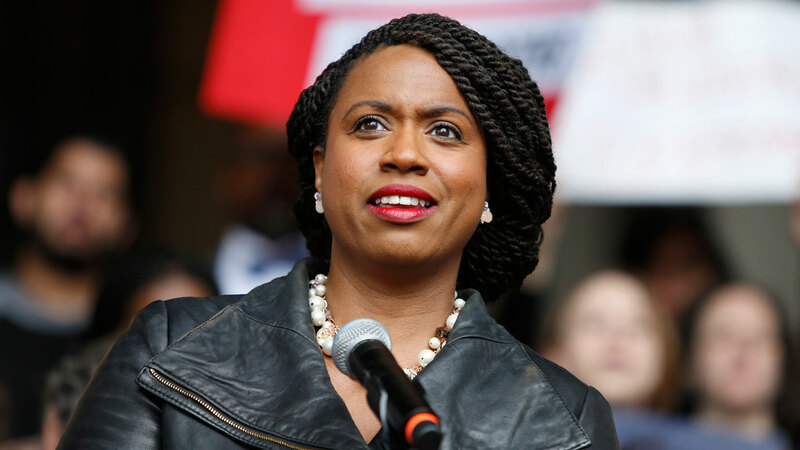 Rep. Ayanna Pressley (D-MA) is the state's first black woman in Congress. To celebrate her first day in office, Pressley praised other women taking office to represent Massachusetts at various levels of government. Today #MA welcomed a new slate of bold leaders to usher in a wave of change across our commonwealth. Congrats to my #sistersinservice & #partnersingood @lizforma @nikaelugardo @rollins4DA @TeamTram @Jo_Comerford & to the other newly sworn in elected leaders. The work continues. Rep. Veronica Escobar (D-TX) is representing Texas' 16th district. She is one of two women who are the first Latinas to represent Texas in Congress. The other Latina congresswoman from Texas is Rep. Slyvia Garcia (D-TX), who is representing the state's 29th district in Houston. She celebrated ahead of her first day with a shirt that bore the phrase "La Congresista." Rep. Ilhan Omar (D-MN) was one of the two first Muslim women to serve in Congress. On Thursday she called the new session of Congress "a new day in America." 23 years ago, from a refugee camp in Kenya, my father and I arrived at an airport in Washington DC. Rep. Rashida Tlaib (D-MI) is also one of the first two Muslim women to serve in Congress. "Screaming inside!" Tlaib wrote on Instagram. "Thank you for believing in me. Fighting for you will be an honor. #rootedincommunity #unapologeticallyMe"
On Thursday, former New Mexico state Democratic Party chairwoman Rep. Deb Haaland (D-NM) became one of the first two Native American women to serve in Congress. The Native American woman who joins Haaland is Rep. Sharice Davids (D-KS). Davids is also Kansas's first openly LGBT candidate to win a major office. Sen. Krysten Sinema (D-AZ) narrowly defeated Republican Martha McSally in the Arizona senate race, but due to Sen. John McCain's death, they are both taking office as the state's first females to serve in the chamber. Sinema was sworn in first as the senior senator. Though she does not speak often about her personal life, Sinema became the first openly bisexual member of Congress when she joined the House of Representatives. On Thursday she became the first openly bisexual U.S. senator. A series of events led Sen. Martha McSally (R-AZ) to become a senator after being defeated in a senate election. After McCain's death in August, Sen. Jon Kyl was appointed to his seat, but he only promised to serve until the end of 2018. With Kyl's resignation in December, Arizona Gov. Doug Ducey made an announcement that McSally would take over McCain's former seat until a special election can be held in 2020. It has been an honor to serve AZ’s 2nd District over the past 4 years. I was constantly inspired by the people of Southern Arizona. Tomorrow at noon, I’ll take the Oath of Office as a United States Senator. I look forward to advocating for our great state and all Arizonans. The Associated Press and ABC News contributed to this report.